Looking for methods to make gel candles at home for your Diwali decoration? You can make colorful gel candles at home very easily. Read the below mentioned articles to know about the easy steps to make gel candles at home. Gel candles are the easiest way to decorate your home for any festival or occasion; they add some extra zing to your home decor. Gel candles are the long lasting candles as they burn longer than the wax candles. You can purchase material to make gel candles online from candle making suppliers or from your local market craft store. You can also buy gel candle making kit which has all the material required to make gel candles at home. -	First choose a suitable container for your gel candle; according to us glass containers are the best. 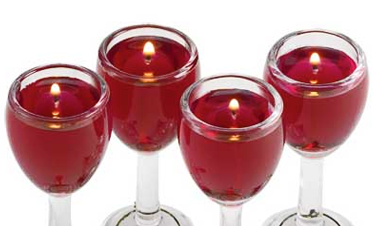 You can use any glass, wine glass, or even a small wide vase with minimum 2 inches diameter to make gel candles. -	Dribble small amount of glue in the centre of the container bottom and set the wick in it. -	Cut the gel into small cubes and heat it in a stainless steel pot on medium flame until the gel become smooth. Keep the temperature 200 degrees Fahrenheit. -	Preheat the glass container in the oven or microwave to about 150-160°F to reduce the appearance of bubbles. -	Dip embeds in hot gel first and then arranges them in the container as you like. -	Now pour the gel into the container from the side to prevent bubbles. -	Pull the wick up Roll it on a pencil to keep it straight. -	Trim the wick up to required length. You gel candle is ready for use, light it up and enjoy. You can also make color layered gel candles by pouring the layers of different color gels in a glass container.